Travelers in need of a strong, dependable, and attractive way to carry their belongings will appreciate the gray and black BA30 Elite Vacationer Luggage from Pelican. This FAA-approved carry-on luggage case is made of lightweight injection-molded HPX high-performance resin. It features Valox latches, a TSA-approved combination lock, a self-regulating vent, stainless-steel hinge pins, and a fabric interior. Carry your Elite with the top handle, side handle, or retractable trolley handle. Built-in wheels with ball bearings make traveling over level ground fast and easy. Each Elite has passed submergence tests for one hour at a depth of one meter, and free-fall impact tests with up to 25 pounds of weight. The suitcase meets airline checked baggage regulations (measures less than 62"). Double wall polypropylene with polycarbonate trim can withstand loads up to 1,500 lb. Box Dimensions (LxWxH) 29.0 x 20.0 x 13.0"
BA30 Elite Vacationer Luggage (Gray and Black) is rated 3.6 out of 5 by 11. Rated 2 out of 5 by Taylor from Pelican's worst product. I've been using this case for heavy travel the last eight months. I have the smaller version too, which travel together. Both of them look good, but that's about it. They're both falling apart and the locks barely work anymore. I could get around the lock issue, but there's no way to use your own locks on this case. Pelican designed this case with a lot of tiny screws and vibration easily makes them fall out. My locking system is only holding on by one screw now. It's crazy to pay this much money for a case that isn't really made for travel. I own about 25 different pelican cases and this one doesn't live up to the name. DO NOT BUY. Rated 3 out of 5 by Anonymous from Sturdy but not indestructable This case is admittedly heavier the similar sized suitcases but the few pounds it has on other definitely makes up for how sturdy and protective it is. The outside scuff up quickly but the bright blue accents make the design look striking and modern and its a breeze to recognize and pick out of a pile of luggage. My first case was cracked during the first international flight - it seems the case was dropped on the corner and a hairline crack went through the sealing lip of the case. I attribute this to loading 75 lbs of Christmas gifts into the box. Pelican processed my return and shipped me a new one in no time after sending pictures of the field destruction they had me do. Rated 1 out of 5 by jcallah from Not Pelican Strong I've owned this product for 6 months. I've taken in on about 8 round trip flights. The lock broke in the first 4 months, now the colored trim is cracked. Hinges feel flimsy as well as most of the plastic. I use real Pelicans to ship sensitive scientific equipment and expected some compromises in the luggage to save weight, but not this poor of a quality product. I could have bought 5 $ suitcases for the next five years, instead I got one that didn't make it six months. I guess I can send it back for warranty every few months for the next couple of years... If you travel once every few years and want to look like a travel warrior then get it. If you actually travel frequently and want something durable find something else. Rated 4 out of 5 by jpov from Quality luggage I'm using this for basic travel. I wanted something that looked good and was durable. It fits the bill for that. There is plenty of room for a multi day trip, closure and opening is easy. It is a bit heavy. I'm pretty sure if I load it to the gills and have any camera equipment in it I will exceed the 50lb limit and airlines will charge me a extra weight fee. I would prefer 4 rollers instead of the 2 rollers. going through an airport is way easier with a suitcase on 4 rollers. Rated 3 out of 5 by Saul435 from Pelican Elite Luggage LG-BA30 The Pelican Elite luggage series is overall good but it needs more R&D and a price drop. Travellers who want a tough protective case, without the weight of traditional Pelican cases, and without a look that advertises expensive goodies inside, will like the Pelican Elite luggage series. I bought the BA30. It is good overall but there are some flaws. First, weight. While it weighs considerably less than an equivalent-sized traditional Pelican case, for today's traveller, struggling against ever lower airline baggage allowances, lighter would be better. Knocking off even one more kilo would help. My second gripe is the combination lock. It is fiddly, unreliable, and easy enough to pop open with a screwdriver. I followed Pelicans' instruction to the tee but I was unable to set the combination lock (maybe mine had a fault). Eventually I got it locked but I could not open it at my destination. In desperation I popped it open with a screwdriver and ripped off the now useless hinge with my fingers. That was easy enough to do and made me wonder just how thief-proof it is. If Pelican made provision ALSO for a PADLOCK this would be a much better case (your padlock would have to be TSA-friendly, of course). 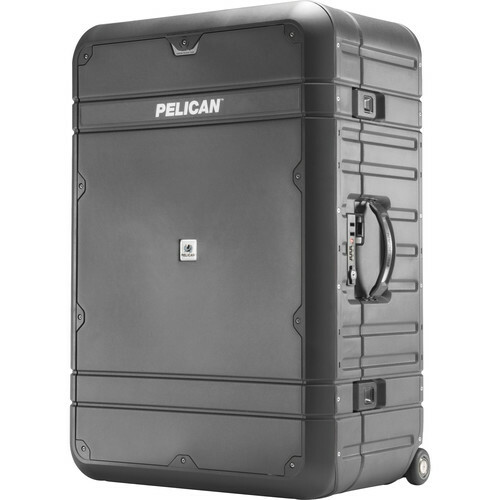 Third, the wheels are robust but not as robust as traditional Pelican cases. Fourth, the hinges do not compare to the hinges on traditional Pelican cases. I doubt these hinges will last for many years. Fifth, there should be one even bigger size on offer, say an Elite 33. Just a few more centimetres might not seem much, but it would allow one to bring a few more items, or even save carrying a second bag. I was unable to put my video tripod into it, even with its head removed. So I had to bring second bag. A real pain. Now the good news. My Elite 30 took a beating on a recent trip to Papua New Guinea and held up well despite heat, humidity and rough handling. It was thrown onto trucks, covered with a ton of other luggage, sat on, stood on, left in the rain, swept by sea water (not submerged...I do not trust it to be submersible, sorry Pelican). It did take some damage when it was dragged along rough ground. And it did end up with a sunken surface due to someone sitting on it (by contrast, nothing dents a traditional Pelican case). Yet my delicate electronics inside were safe. Would I recommend it? Yes indeed, with the proviso that it is a compromise. While it is a lot better than any tourist suitcase (e.g. Samsonite) it is considerably less rugged than a traditional Pelican case. I would happily accept this compromise if weight and reliability were improved. If Pelican puts some more R&D into the second generation it could be the perfect traveller's companion. Meanwhile, if you need serious protection get a traditional Pelican case not a Pelican Elite Luggage case. I also think the price is way too high for a case of this quality. Rated 4 out of 5 by Jeremy A. from sturdy, but flawed This Pelican case is rock solid, so much so I feel as though if I were to drop it on the floor I would damage my floor more than I would damage the luggage. Which is why I bought it, and I'm happy with that, but that being said after taking it on a flight I found some flaws. There is nothing inside. No pockets, no straps, just bare fabric lining. So unless you pack it FULL your contents are going to shift. Empty, my luggage scale weighed this at about 19 pounds (my prior soft side large suitcase was 14 pounds), so its not as heavy as a traditional rugged Pelican case but its not exactly light either. Lastly, the latches are great but they don't always line up to close the case. Once the suitcase is closed its sturdy, but opened its like the halves want to shift and flex. Overall I don't regret the purchase at all, it survived a flight unscathed, but for the price it does seem to be lacking a few simple practical features. Yes I know they offer a lid organizer for purchase separately but I think I would give this 5 stars if it just had internal elastic straps. Rated 5 out of 5 by Kate from I've been waiting for this... I've been waiting for ...something that would satisfy my need for luggage that has a clean and durable exterior; stylish; and enough room to hold what everything I need. This ladies and gentlemen is it! It is pricey, but it's worth it if it's going to last me. Buy once, cry once. What does the interior of these cases look like? what is the actual weight of the case your site said 19.4 another site said 15.6? My luggage scale read 19 empty, as Andrew mentioned this is without the lid optional lid organizer.